Defence Connect can today confirm that BAE Systems Australia has selected its industrial partners to deliver the combat system integration for the nation’s $35 billion Hunter Class frigate project. BAE Systems Australia has selected Lockheed Martin Australia and Saab Australia to partner with the company to deliver combat system integration on the Royal Australian Navy's new Hunter Class frigates. BAE Systems Australia Hunter Class frigate program managing director Nigel Stewart said, "The Hunter Class combat system is a vital piece of the frigate’s infrastructure, which will give the men and women who operate these ships the capability to protect the nation against airborne, surface and under-sea threats." Minister for Defence, Christopher Pyne welcomed the announcement, saying the $35 billion frigate program would provide the Navy the highest levels of lethality and deterrence that our major surface combatants need in periods of global uncertainty. "I would like to congratulate Lockheed Martin Australia and Saab Australia for being named the preferred tenderers to partner with BAE Systems Australia to deliver the Combat System Integration on the Hunter class frigates," Minister Pyne said. The decision is expected to create up to 200 jobs and supports the development of an Australian industry which will underpin the Government’s continuous Naval Shipbuilding Plan. "I would like to congratulate Lockheed Martin Australia and Saab Australia for being named the preferred tenderers to partner with BAE Systems Australia to deliver the Combat System Integration on the Hunter class frigates. The Combat Management System for the new Hunter class frigate fleet will be the Aegis System, together with an Australian tactical interface to be developed by Saab Australia," Minister Pyne explained. In 2017, the government announced that it would equip Australia’s navy with the world’s best technology. The combat management system (CMS) for the new Hunter Class frigate fleet will be the Aegis Combat System, together with an Australian tactical interface to be developed by Saab Australia. Lockheed Martin Australia and New Zealand, Chief Executive, Vince Di Pietro welcomed the announcement, saying "Lockheed Martin is delighted to partner with BAE Systems and Saab Australia to integrate the Hunter class combat system into Australia's future frigates." Aegis is the world’s most advanced maritime warfighting capability and the world’s only maritime ballistic missile defence system. Aegis is currently successfully integrated across 107 ships and nine classes for six nations, including the US, Japan, Australia, the Republic of Korea, Spain and Norway, proving the system is a truly global force in ensuring maritime capability. "Lockheed Martin has more than 40 years of experience in the production and integration of Aegis combat systems around the world. We look forward to partnering with the Commonwealth, the United States Navy, BAE Systems and Saab Australia to integrate, operate, and maintain the system right here in Australia, by Australians," Di Pietro added. Centred around the AN/SPY-1 radar, Aegis is a fully integrated combat system, providing full 360-degree, 3D tracking capacity. Aegis is capable of simultaneously defending against attack from land targets, submarines and surface ships while automatically protecting the fleet against aircraft cruise missiles and ballistic missiles. Integrating Aegis into the Future Frigates ensures immediate integration into coalition task forces from the first arrival at an area of operations and provides growth to capabilities like IAMD and BMD roles. Aegis serves as the US Navy’s maritime command and control hub for the joint, integrated and networked battlespace and is the key maritime component of the US’ BMD umbrella. "This is a fantastic result for Saab Australia and the result of many years of hard and diligent work by our staff. It is the culmination of over 30 years of collaborating with BAE Systems Australia in integrating complex combat systems for the Royal Australian Navy," said Andy Keogh CSC, Managing Director, Saab Australia. BAE Systems was named in June this year as the preferred contractor for the $35 billion Hunter Class Frigate Program. Nine of the most advanced anti-submarine warships will be built in South Australia, creating and sustaining 5,000 jobs across the nation. As part of a competitive tender process and following a rigorous evaluation, Lockheed Martin Australia and Saab Australia were selected because they each offered strengths and technical expertise that will best complement BAE Systems’ capability. "We can be proud that this capability is being created in Australia and that the Hunter Class program will sustain the existing skills and experience of the engineers already delivering capability to the Navy," Stewart said. In October, BAE Systems Australia announced that it had signed an Advanced Work Arrangement (AWA) with the Australian government for the Hunter Class Frigate Program. The AWA allows BAE Systems to continue to mobilise the program, including maturing design and engineering plans, establishing a skilled work force and setting up the required infrastructure necessary to commence prototyping in 2020. Minister Pyne said, "The frigates will not only help secure Australia’s interests through enhanced capability but the program will also be delivered by Australian workers, with unprecedented levels of Australian industry opportunities in the global supply chain." 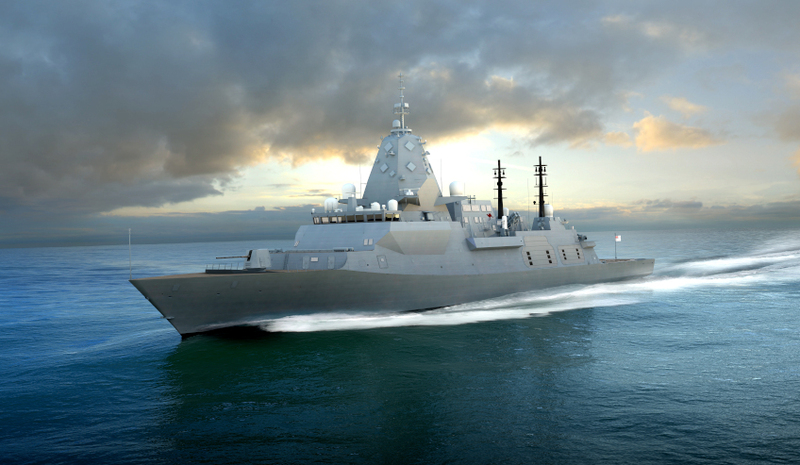 The Australian government mandated the US Navy’s Aegis Combat Management System and the Australian CEAFAR radar as part of the design of the new frigates, with an Australian interface to be developed by Saab Australia to incorporate all other attack and defence systems, including the Nulka decoy, and sonar systems from Thales and Ultra. Construction of the Hunter class frigates will begin at Adelaide’s Osborne Shipyard in 2020 and the program will employ around 4000 workers.